UPDATED: Thu., June 14, 2018, 10:24 p.m.
A nonprofit formed by the families of students at Sandy Hook Elementary, the site of a shooting that killed 20 children nearly six years ago, awarded Rep. Cathy McMorris Rodgers on Wednesday for her work on a federal law authorizing funding for school safety and training programs. The recognition from Sandy Hook Promise, an organization formed following the shooting in Newtown, Connecticut, in December 2012, goes to a lawmaker who has received favorable ratings and political contributions from the National Rifle Association. The group’s legislative policies do not call for a ban on firearms, instead focusing on promoting research into the causes of school violence and increasing funding for mental health programs, policies the congresswoman has said she supports. But the group also wants to restrict magazine sizes on guns available at retail, a policy proposal McMorris Rodgers said earlier this year she doesn’t support, and which puts her at odds with her presumptive opponent in the November election, Democrat Lisa Brown. “We support the Second Amendment,” the group says on its website. “We recognize an individual’s right to bear arms and support millions of law-abiding citizens in the United States who own firearms.” In not supporting a ban on firearms, Sandy Hook Promise stands in contrast to the group Everytown for Gun Safety, a nonprofit backed by former New York City Mayor Michael Bloomberg that is advocating for a ban on the sale of assault-style firearms. In remarks made at a reception in Washington, D.C., on Wednesday night provided by McMorris Rodgers’ office, the congresswoman said the country needed to continue talking about what measures will reduce gun violence in schools. 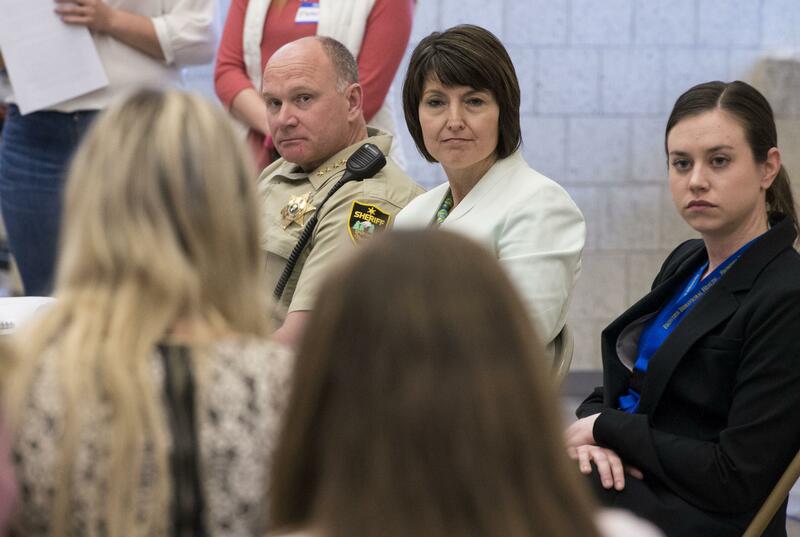 Earlier this year, McMorris Rodgers participated in a telephone conference call with local law enforcement and school district representatives that emphasized more funding for mental health counselors and empowering students to speak up about concerns they have about their peers. McMorris Rodgers was honored along with Sen. Bob Casey, D-Pa., for “their commitment to creating safer communities through their gun violence prevention and mental health awareness work,” according to a news release from the organization. A spokeswoman for the organization said that board members were unavailable for an interview Thursday. Sandy Hook Promise gave the award for McMorris Rodgers’ work in supporting the federal law, which was included in the federal spending bill signed by President Donald Trump in March. The law authorized spending of up to $50 million annually for the next decade on readiness training for dealing with active shooting situations, and another $25 million each year for security upgrades at schools, such as metal detectors. The bill, which was backed by the Sandy Hook Promise group, sailed through the House of Representatives in the wake of the shooting at Parkland, Florida, earlier this spring. Critics, among them Democratic Rep. Jerrold Nadler of New York, voted for the legislation but said Congress would make a bigger difference if it addressed access to guns. Brown echoed those concerns in an interview Thursday, saying the recognition belonged to the organizers of groups aiming to change gun laws, not legislators. Sandy Hook Promise is perhaps best known for its series of public service announcements calling for students, teachers and parents to recognize warning signs that could indicate a shooting. A video published in 2016, titled “Evan,” follows a high school student trying to discern the identity of a secret pen pal before summer break. In the background, another student shows anti-social behavior and is revealed at the end of the video to be plotting a shooting. The short film won an award at the Cannes film festival in 2017. The spate of school violence reached the Inland Northwest last fall, when a gunman entered Freeman High School and killed a fellow classmate. The recent shooting in Parkland, Florida, has prompted a flurry of policy promises from President Donald Trump, some of which will require Congressional action. Here’s where the candidates for Eastern Washington’s seat in the House of Representatives stand on gun control issues. Would you support a reintroduction of the federal firearms ban that was in place from 1994 to 2004. The act outlawed the manufacture and transfer of certain magazine sizes and weapons, including the AR-15 rifle, and the possession of those weapons if they were made after the date the law was enacted. The bill would need to address the millions of AR-15 style rifles already in circulation. Brown wouldn’t take a position on what should happen to those weapons in circulation if a potential ban is passed. The Second Amendment protects the right of the people to own these firearms. Should the federal government ban the sale of “bump stocks”? Congress waited too long to act on this. The congresswoman supports the position of President Donald Trump, who has ordered the Justice Department to draft regulations banning the devices. Should the federal government promote the arming of teachers? It doesn’t address other types of public shootings (concerts, movie theaters) and could make classrooms more dangerous. Communities, including Spokane, need to have more discussions about what makes sense. Federal funding should go toward mapping and emergency plans. Do you support the continuation of the so-called “Dickey amendment,” which prohibits funding for the Centers for Disease Control to be spent on gun violence research? Data should be used to make decisions, and Congress should have identified this as a public health issue sooner. The language should be removed from spending bills. The congresswoman has voted for budgets in the past that included the language, including in December 2015, after Democrats sought to remove it. The Trump administration has said they believe, even with existing language, the CDC could conduct research on gun violence. Should the federal government restrict the size of rifle magazines? All groups should speak on the issue, but there is research to suggest smaller gun sizes would reduce the scope of the violence. Magazines shouldn’t be restricted for law-abiding citizens. Federally licensed firearm dealers must conduct background checks under federal law before selling a gun. Private sellers are not required to do so under federal law, though it’s required in Washington state. Should the federal government enact policy that would require background checks for all private sales of firearms nationwide? Most Americans support introducing additional background check measures (a recent Quinnipiac University poll found 97 percent of Americans supported universal background checks for gun purchases). States should be allowed to come up with their own laws, as Washington has done. The federal government should focus on improving the background check list. Under federal law, a gun can be sold by a licensed dealer as soon as a background check is completed. Should there be a mandatory waiting period before the purchase of rifles capable of semi-automatic fire? We need to look at the evidence and see if such waiting periods reduced violence. The federal government shouldn’t limit access to guns for law-abiding citizens. Do you support the creation of a gun violence restraining order, or some type of court-ordered confiscation of a gun that is temporary, instigated by law enforcement and reviewed by a judge? The person’s civil rights and due process would need to be respected in the process. A new court order shouldn’t be added to the background check system until we’re sure that system works as intended, and there are concerns about due process. Should concealed carry permits be recognized across state lines? The federal government shouldn’t require states to accept other states’ permits, but she would support interstate agreements. The congresswoman has voted and endorsed federal legislation that would allow anyone with a concealed carry permit to carry in other states that also have concealed carry permits. The Senate has not acted on that legislation. Last year, the Republican Congress repealed an Obama-era rule that could prevent gun sales to recipients of government assistance, whose finances were handled by others. Do you support this repeal? Congress should have instead held hearings and taken testimony to make sure the lines are being drawn in the right places on such regulations. The action could have prevented law-abiding elderly and disabled citizens from attaining guns. Should the federal government prohibit the sale of suppressors? After further review of the issue and speaking with experts, suppressors should be banned for recreational use. They are devices that do not completely silence the sound of gunfire and promote hearing safety for shooters. Weapons capable of fully automatic fire were banned under federal law in 1986. Do you support the current federal restrictions on owning automatic weapons? Should the legal age for purchasing a semi-automatic rifle be raised to 21? It wouldn’t prevent people under age 18 from being trained to use the weapon, or practice. But they don’t need to own one. If you can join the military at 18, you should be able to own a firearm at 18. This issue grid was updated on June 15, 2018, to reflect Lisa Brown’s change in position on prohibiting the sale of suppressors. Published: June 14, 2018, 6:23 p.m. Updated: June 14, 2018, 10:24 p.m.